In their simplest form, steels are alloys of Iron (Fe) and Carbon (C). The study of the constitution and structure of iron and steel start with the iron-carbon phase diagram. It is also the basis understanding of the heat treatment of steels. The Iron Carbon diagram is shown in Fig. 1. The diagram shown in Fig 1 actually shows two diagrams i) the stable iron-graphite diagram (dashed lines) and the metastable Fe-Fe3C diagram. The stable condition usually takes a very long time to develop specially in the low temperature and low carbon range hence the metastable diagram is of more interest. Many of the basic features of this irpn carbon system also influence the behavior of alloy steels. For example, the phases available in the simple binary Fe-C system are also available in the alloy steels, but it is essential to examine the effects of the alloying elements on the formation and properties of these phases. The iron-carbon diagram provides a solid base on which to build the knowledge of both plain carbon and alloy steels. There are some important metallurgical phases and micro constituents in thr iron carbon system. At the low-carbon end is the ferrite (?-iron) and austenite (?-iron). Ferrite can at most dissolve 0.028 wt% C at 727 deg C and austenite (?-iron) can dissolve 2.11 wt% C at 1148 deg C. At the carbon-rich side there is cementite (Fe3C). Between the single-phase fields are found regions with mixtures of two phases, such as ferrite & cementite, austenite & cementite, and ferrite & austenite. At the highest temperatures, the liquid phase field can be found and below this are the two phase fields liquid & austenite, liquid & cementite, and liquid & ferrite. In heat treating of steels, the liquid phase is always avoided. Some important boundaries at single-phase fields have been given special names that facilitate the understanding of the diagram. 1. Austenite or ?-iron phase – Austenite is a high temperature phase and has a Face Centred Cubic (FCC) structure (which is a close packed structure). ?-iron is having good strength and toughness but it is unstable below 723 deg C.
2. Ferrite or ?-iron phase – It is relatively soft low temperature phase and is a stable equilibrium phase. Ferrite is a common constituent in steels and has a Body Centred Cubic (BCC) structure (which is less densely packed than FCC). ?-iron is soft , ductile and has low strength and good toughness. 4. Pearlite is the ferrite-cementite phase mixture. It has a characteristic appearance and can be treated as a micro structural entity or micro constituent. It is an aggregate of alternating ferrite and cementite lamellae that degenerates (“spheroidizes” or “coarsens”) into cementite particles dispersed with a ferrite matrix after extended holding below 723 deg C. It is a eutectoid and has BCC structure. It is a partially soluble solution of Fe and C. It has high strength and low toughness. In case of non-equilibrium solidification of Fe-C system the following main micro structures may be formed. • Bainite is a phase between pearlite and marten site. It is hard metastable micro constituent; non lamellar mixture of ferrite and cementite on an extremely fine scale. Upper bainite is formed at higher temperatures has a feathery appearance. Lower bainite is formed at lower temperatures has an acicular appearance. The hardness of bainite increases with decreasing temperature of formation. It is having good strength and toughness. • Martensite is formed by rapid cooling and is hard and brittle. It is super saturated solution of C atoms in ferrite. It has a bct structure and a hard metastable phase. It has lath morphology when 1.0 wt% C and mixture of those in between. It is having high strength and hardness and low toughness. 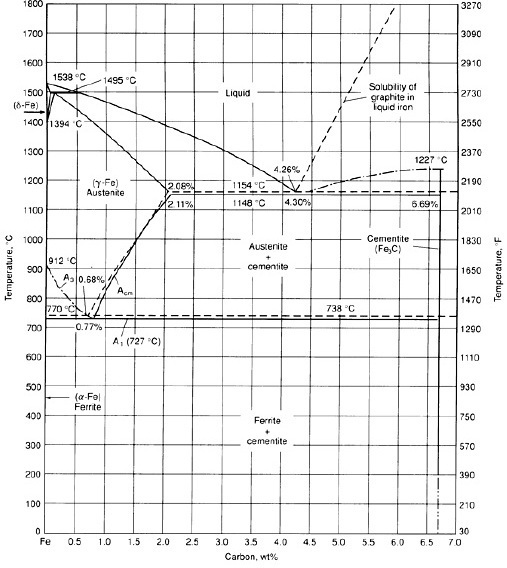 There are many temperatures and critical points in the Iron-C diagram which are important both from the basic and the practical point of view. • The A1 temperature at which the eutectoid reaction occurs, which is 723 Deg. C in the diagram. A1 is called eutectoid temperature and is the minimum temperature for austenite. • At the lower-temperature boundary of the austenite region at low carbon contents is the ?/? + ? boundary. • Acm is the counterpart boundary for high carbon contents, that is, the ?/? + Fe3C boundary (Pearlite boundary). The carbon content at which the minimum austenite temperature is attained is called the eutectoid carbon content (0.77 wt% C). • The A4 temperature at which austenite transforms to ?-iron, 1390 Deg. C in pure iron but this temperature is increased as carbon is added. • The A2 temperature is the Curie point when iron changes from the ferro to the paramagnetic condition. This temperature is 769 Deg. C for pure iron, but no change in crystal structure is involved. • Accm is the temperature when in hypereutectoid steel at which the solution of cementite in austenite is completed during heating. • Ac1 is the temperature at which austenite begins to form during heating, with the c being derived from the French chauffant. • Ac3 is the temperature at which transformation of ferrite to austenite is completed during heating. • Aecm, Ae1, Ae3 are the temperatures of phase changes at equilibrium. • Arcm is the temperature when in hypereutectoid steel, the temperature at which precipitation of cementite starts during cooling, with the r being derived from the French refroidissant. • Ar1 is the temperature at which transformation of austenite to ferrite or to ferrite plus cementite is completed during cooling. • Ar3 is the temperature at which austenite begins to transform to ferrite during cooling. • Ar4 is the temperature at which delta ferrite transforms to austenite during cooling. • Ms (or Ar”) is the temperature at which transformation of austenite to martensite starts during cooling. • Mf is the temperature at which martensite formation finishes during cooling. All of the changes, except the formation of martensite, occur at lower temperatures during cooling than during heating and depend on the rate of change of temperature. Under equilibrium conditions, pro-eutectoid ferrite will form in iron-carbon alloys containing up to 0.8 per cent carbon. The reaction occurs at 910 Deg. C in pure iron, but takes place between 910 Deg. C and 723 Deg. C in iron-carbon alloys. However, by quenching from the austenitic state to temperatures below the eutectoid temperature Ae1, ferrite can be formed down to temperatures as low as 600 Deg. C. There are pronounced morphological changes as the transformation temperature is lowered, which it should be emphasized apply in general to hypo-and hyper-eutectoid phases, although in each case there will be variations due to the precise crystallography of the phases involved. For example, the same principles apply to the formation of cementite from austenite, but it is not difficult to distinguish ferrite from cementite morphologically. Pearlite is the most familiar micro structural feature in the whole science of metallography. It was discovered by Sorby over a century ago, who correctly assumed it to be a lamellar mixture of iron and iron carbide. It may be seen that the normal Iron carbon equilibrium diagram represents the metastable equilibrium between iron and iron carbide. Cementite is metastable as the true equilibrium is between iron and graphite. Although graphite occurs extensively in cast irons (2 to 4 wt per cent carbon), it is usually difficult to obtain this equilibrium phase in steels (0.03 to1.5 wt per cent carbon). Therefore, the metastable equilibrium between iron and iron carbide is normally considered, since it is relevant to the behavior of a variety of steels in practice. On comparing austenite (?-iron) with ferrite (?-iron) it is noticed that solubility of carbon is more in austenite with a maximum value of just over 2 wt per cent at 1147 Deg. C. This high solubility of carbon in austenite is extremely important in heat treatment, when solution treatment in the austenite followed by rapid quenching to room temperature allows formation of a supersaturated solid solution of carbon in iron. The ferrite phase is restricted with a maximum carbon solubility of 0.02 wt per cent at 723 Deg. C. Since the carbon range available in common steels is from 0.05 to 1.5 wt per cent, ferrite is normally associated with cementite in one or other form. Similarly, the ?-phase is very restricted and is in the temperature range between 1390 and 1534 Deg. C and disappears completely when the carbon content reaches 0.5 wt per cent. VERY GOOD article. Keep it.